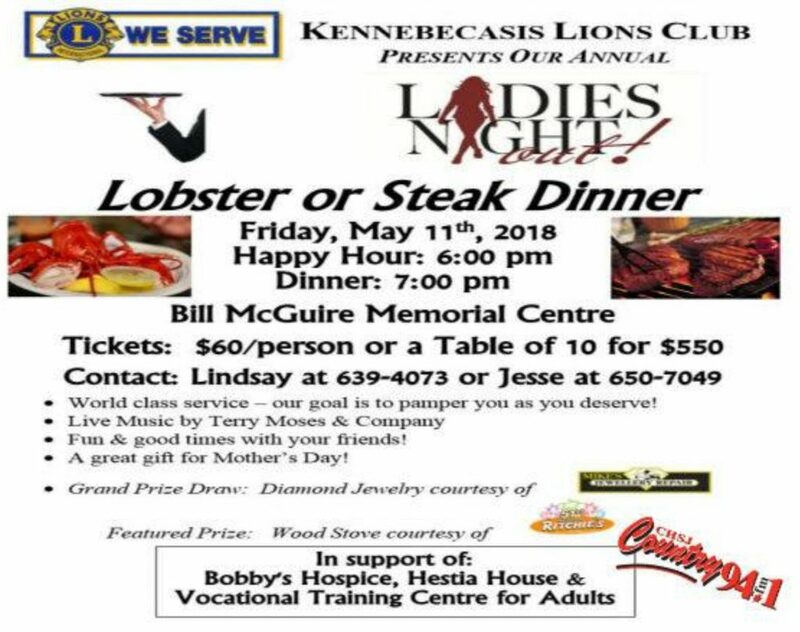 The Kennebecasis Lions Club Annual Ladies Night Out – Lobster or Steak Dinner in support of Bobby’s Hospice, Hestia House and Vocational Training Centre for Adults will be held at the Bill McGuire Centre, 95 James Renforth Drive, Rothesay, New Brunswick, on Friday, May 11th, 2018. Enjoy your choice of steak or lobster, complimentary wine, live music, a live auction and two grand prize draws!! World class service – our goal is to pamper you as you deserve!! Fun and good times with your friends and a great gift for Mother’s Day!! Happy Hour is at 6:00 p.m. and the Dinner at 7:00 p.m.
Tickets are $60 per person or $550 for a table of ten. Live Music will be provided by Terry Moss and Company. ← Taste Of Egypt Services Includes Families.